On Wednesday night of the DCI Championship week, an exhibition was held in Madison with performances by Capital Sound, Jubal, Madison Scouts and the Madison Scouts Alumni Reunion Project. This event allowed for a wonderful opportunity to capture a photo this group has been anxious to coordinate. Starting from right to left is William Veerhusen. Bill marched baritone in the Madison Scouts from 1973 through 1977. To the left is Bill's nephew, Joe Madden. Joe is a current Scout, having marched 2005 on trumpet and 2006 on mellophone. To the left of Joe is Bill's brother, Dan Veerhusen. Dan marched in the Madison Scouts from 1973 to 1980, being assistant drum major in 1978, co-drum drum major in 1979 and full drum major in 1980. Dan has adopted Joe as his Scouts "little brother." Left of Dan is long-time family friend, Jeff "Fish" Troudt. Jeff marched baritone with the Scouts from 1974 through 1977. This special picture was taken by Kathy Veerhusen -- wife of Bill, aunt of Joe, sister-in-law of Dan and friend of Jeff. 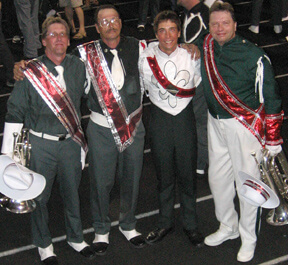 Seeing all four of these "Men of Madison" together in uniform illustrates a very special family tie and just one of the timeless and continuous links in the Madison Scouts' brotherhood.